I use Eriogonum grande rubescens in full sun or dry dappled shade. Red Buckwheat is sensitive to excess water but will spread quite well if given benign neglect. The round gray-green leaves set off the clusters of pink blooms very well. Eriogonum grande rebescens grows to about 18" tall and 3' across. Hairsteaks and other butterfly's will find this buckwheat to be an excellent nectar source. Eriogonum grande rubescens is native to the Channel Islands. 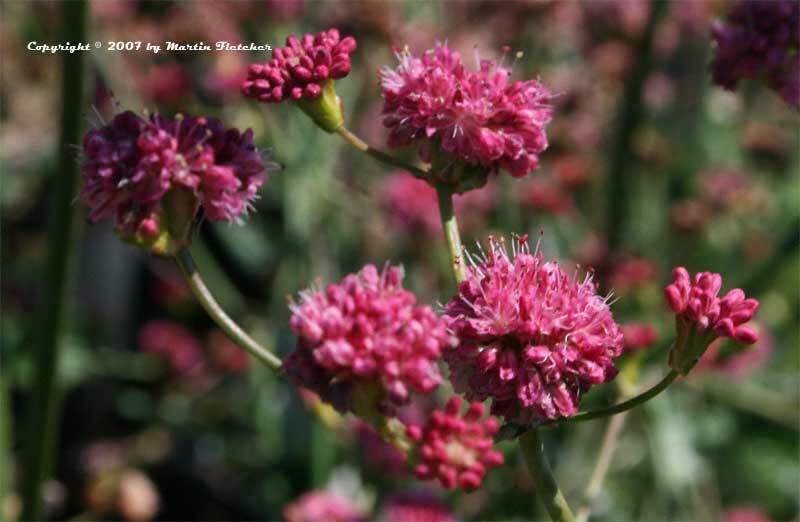 Eriogonum grande rubescens is a great addition to the butterfly garden where it is a nectar source for the Gray Hairstreak, the Common Buckeye and the Mournful Duskywing. Eriogonum grande rubescens is a host plant for the Western Tussock Moth Caterpillar. Red flowers of Eriogonum grande rubescens Red Buckwheat or Pink Buckwheat. High resolution photos are part of our garden image collection.